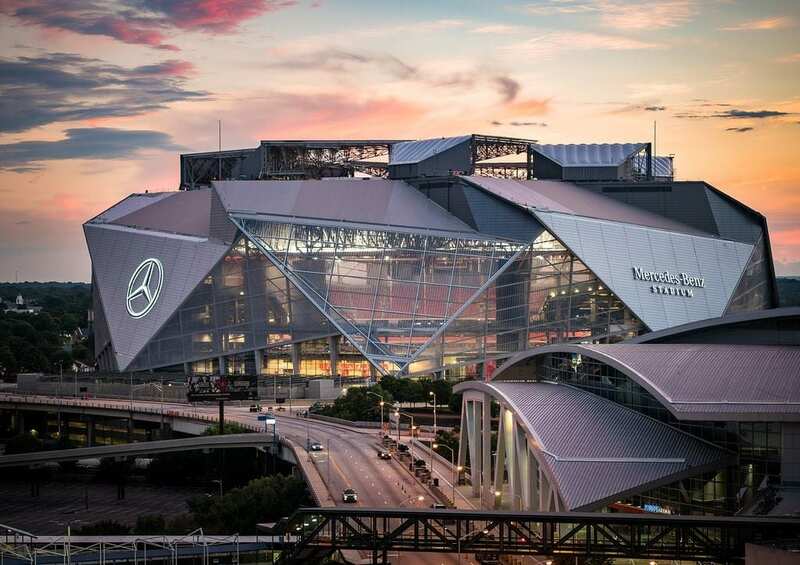 Living in Atlanta, we all heard the buzz coming a year out from the 2017 opening of the new Mercedes-Benz Stadium. “Falcons and Atlanta United FC owner Arthur Blank is making concessions affordable!” The reaction was common: “Hmmm…makes sense. If I am not gouged on concessions prices, I might be willing to attend more games …and bring more family members because I can afford to feed them when we’re there”. After attending two football games and two soccer matches in two years (two more of each than I attended in the previous two years before fan-friendly concessions) I can vouch for its effect on the city. Butts in seats, raving / happy fans, and a notoriously luke-warm sports city is instantly hot on their sports teams. Phillips Arena in Atlanta (recently re-opened as State Farm Arena… fingers crossed it will become known as “the Jake” after Jake from State Farm) adopted the same philosophy to launch the new Hawks season this year (2018-19) and I see a fuller-than-usual Hawks stadium when the cameras pan back. The trend is catching on as Texas Memorial Stadium in Austin, and Baltimore Orioles and Ravens stadiums have adopted fan-friendly pricing structures. The tickets and parking are still pricey as are the jerseys, hats and foam fingers…but something about cheap food touches a nerve in just the right way. So, what’s that nerve? Can restaurants tap into it? Nothing sparks innovation like competition…and Mr. Blank seems to have recognized that stadium attendance is competing with 70 inch, 4KHD TV’s and leather recliners. However, food and drinks are tangible and consumable, so they can’t be replaced by pictures or recordings of them. This means that the nerve to tap is VALUE. That’s not to say that the cheapest food wins. Not at all. Almighty Google defines VALUE as: the regard that something is held to deserve. Consumers are looking at a whole experience when determining if something is valuable to them, not just the price. In the case of fan-friendly concession, consumers seem to really respond to fair food pricing because they can compare it to similar food pricing elsewhere. When the price of food and drinks at the stadium matches the pricing and qualify of food they can get outside of the stadium, then all of the other expensive things (tickets, parking, souvenirs, etc.) seem reasonable too. Grocery stores and gas stations apply this principle all the time. If Bananas at Kroger are $0.69/lb. and the Bananas at Whole Foods are $.99/lb., it doesn’t matter if the fried chicken or the sliced meats are the same price or less at Whole Foods.People will comparatively shop businesses on the things they know, applying their judgement of the common item to the rest of their offering. Convenience stores know that customers will drive an extra mile or even make an inconvenient U-turn on a divided highway just to save $.01 on a gallon gas.If the store is clean and the gas is consistently cheaper than their competitors, customers will become loyal to the brand. When they choose to buy snacks and other items inside the convenience store, those items may or may not be less expensive, which often goes unnoticed. The key is volume. Volume will offset any losses arising from the discount, if any at all when smartly assembling the assortment. Affordable Signature Drink – for a Mexican-style restaurant, the most obvious choice is a House Margarita. For a steakhouse, jump on the bourbon bandwagon and showcase an incredible House Manhattan using reserve bourbon and garnish with Luxardo cherries. Use great ingredients but price it below expectation – to compete with anyone. Margins won’t be as high but that’s not the point. Customers need to say, “Wow! Their house Manhattan is awesome…and it’s only $8”. Then they’ll splurge on the Bone-In Ribeye. Or in the case of the Margarita, they’ll splurge on appetizers because their drink was so reasonable….and they will almost certainly have a second drink. Half Portions– This is particularly helpful for Italian-style restaurants serving pasta. By offering a half portion, diners can enjoy lighter portions at their discretion. This freedom to eat lighter can improve dining frequency as diners will remember that the restaurant is on the short list for different dining occasions. It also allows diners to indulge by ordering more courses. Be sure to make it easy to understand and don’t get too complex with mix-and-match scenarios. Just offer that salad or bowl of pasta at full size and half size with different prices for each. Customers will appreciate the simplicity. Uber-style Pricing– Everyone knows restaurants are slower on Mondays and Tuesdays. Instead of implementing Happy Hour or specials or Trivia Night to entice folks in the door, try throttling pricing up and down for all items based on demand… similar to what Uber does for peak vs non-peak driving. A restaurant in London, Bob Bob Ricard, has deployed Uber-style pricing with great success. Ala-Carte Pricing– Most restaurants assemble menu items as complete dishes with complementing sides. Side dishes or ala carte selections are often an afterthought, pushed to the back page or to the bottom. It doesn’t feel special to put together your own meal by assembling sides. Tacquerias often offer tacos and enchiladas ala carte only. Even though a taco costs $3, diners are more likely to mix and match tacos and enchiladas to reach check averages that rival full plates. Whether a diner wants to eat light or heavy, ala carte pricing allows them to mix and match without feeling like they’re going off script. Meat-and-3 restaurants and BBQ restaurants also do this. Giving diners control over how much or how little they order can be a nice touch. Complimentary Dessert– I know people who eat at Jason’s Deli because they offer free soft serve ice cream with the purchase of an entrée. Something about that automatic, consistent access to soft serve really resonates. For other restaurants it could be a homemade mini cupcake, fried pie or cannoli delivered after the meal. Many traditional French restaurants offer house chocolates at check delivery. The point is to get people talking about the nice touch, and to have that be something memorable that tips their dining decision when they’re thinking about going out. Extra Beverage– many customers gush over extra beverage served with their ordered beverage. Martini’s shaken at the table where there is more than one glass in the shaker…and the shaker with the extra is left at the table for the guest to top off. The glass of wine poured from a mini-carafe where there is another half pour in the carafe for the guest to self-pour. The coffee served in a cup and served with a side car hottle. Make it consistent and a little special and you’ll be remembered for it. It doesn’t have to be for every beverage – but pick a beverage to make special so it’s easy to for customers to rave to their friends about it. Fan-friendly concessions at sports arenas are here to stay and growing in popularity. They’re well received because they add value to the experience. With most primary and secondary cities offering thousands of restaurant choices, restaurants need to have a competitive edge. Taking a cue from fan-friendly concessions is a good idea. We studied and implemented this philosophy first hand with gourmet grocers and used it to spur sales for other items. Blue Orbit has consulted for several large convenience store brands with over 2000 units combined. Each executive operating team shared the same phenomenon. Do you need assistance with advice on how your restaurant can learn from fan-friendly stadium concessions? We’re here to help! Contact us today, and let’s chat.